What refreshing innocence when an artist reveals that one of their first influences in art was Bob Ross. Nothing pretentious, this isn’t like declaring that the first album you bought was John Coltrane’s Ascension. This is a memory shared by myself and Florida-born, Minneapolis-based painter, Lamar Peterson. Whether through Bob Ross, comic books or growing up in suburbia, the man behind such elegant and, at times, biting social-commentary paintings, has found a way to channel an almost pop beginning into series after series of figurative and experimental representations of Black America. The paintings can be funny, bleak, enchanting, folkloric, historic and darkly idyllic. Now an Assistant Professor of Drawing and Painting at the University of Minnesota Department of Art, Peterson’s recent solo shows at Fredericks & Freiser in NYC, including the recent A Self-Portrait in 2017, are some of his most colorful, unconventional and significant to date. I talked with Lamar Peterson this spring to discuss my favorites amongst his paintings, how teaching helps expand his output and the colors that move him. Evan Pricco: I want to start this interview by talking about two paintings: First, The Conversation. There is so much going on, the different styles, textures, and ideas. Can you walk me through it? Lamar Peterson: I’ve been thinking of a shift in style in recent works, and my other work was mostly concerned with drawing, and the painting was secondary. Flatness and color was an important aspect of the previous work. Now I’m working in oil paint and attracted to the visceral quality of the medium and the ability to create action through a brushstroke. So, I think I’m combining the old and the new in the latest work, combining my love of flatness and interest in gesture. As for the subject matter, it evolved out of a thumbnail sketch I made of an old couple sitting in a pastoral landscape. I wanted to make this ambiguous image of a couple enjoying their land and home, but also engaged in a conversation that appears serious and even intense. There is a flower vase in mid-topple that is outlined in a bold black line to define the object, almost as if it were a children’s sticker on top of the scene. I like the tension surrounding the woman in time, just before something is about to break. EP: And the second painting I want to talk about is A Young Man with a Fish, which, when I saw it in person at Fredericks & Freiser, just floored me. The colors were so vibrant, and the shadow from the tree had this surreal quality. Again, it enveloped so many styles: comics, surrealism, portraiture. Can you talk about this one? LP: To be honest with you, I had been working on several pieces that reflected the fear, anger, hopelessness, and rage that was going on in communities of color who were dealing with police brutality, police acquittals, and the callous indifference by politicians to these matters. It would be an inaccurate title for my show (A Self-Portrait) to not include such images as an African-American man who feels these threats and dark forces regularly. I did a series of depictions of Young Man with a Fish almost as an antidote to those harsher realities. The calm repose, the dappled light, the sense of safety—I needed this contrast to balance the horrors elsewhere in the news and city streets. Like the toppling vase, the bite mark in the fish indicates the lurking presence of violence, however subtle, even in this gentle scene. EP: I think I bring these questions up because that last show in 2017, A Self-Portrait, combined a lot of styles and elements of paintings, from these to some quite abstract works like Twofold and Daylight. I liked that you were going so far into all these styles, but in the same room, and it told a good story. Were any of those works a new style for you? And does that indicate exploration in a particular direction now? LP: Drawing is an important part of my process. I draw what I feel like drawing, without being concerned with style. Just as my accumulations of drawings are often dramatically different from one another, I’ve been experimenting with trying different styles in my paintings as well. EP: Have you ever worked in a medium that wasn't painting for any length of time? LP: Early on in my career, I made several sculptures to accompany the paintings and works on paper. I’ve been thinking a lot about sculpture lately and have some projects in the works. EP: This is the first time we have had a chance to talk, but you are the perfect artist to discuss contemporary painting with. From RISD to Deitch Projects, to Richard Heller and now six shows at Fredericks & Freiser, you have sort of navigated various places in twenty-first century figurative painting. I'm curious what you think of the revival over the last ten years or so, or if you even think of it as a revival? LP: Painting has always been there, and young artists always pick up the brush. So, no, I do not really think of painting as being revived. Collectors and curators decide what is important at any given moment, but there has always been painting. Currently, figurative painting is hot again, and I am excited to see so many artists of color creating figurative paintings and finding success. EP: Self-Portrait seemed like a deeply personal series, and there did feel like a bit of uncertainty going on. The portraits of bees stinging the young black men stand out, especially with the flower vases surrounding the works. It’s this weird balance of quiet and serenity with something sinister. Am I off? LP: I have never specifically set out to make racial statements with my previous works, yet my figures have always been unapologetically black. People would often read into my earlier works some commentary they thought I was making. A Self-Portrait, on the other hand, was delivering a message. Your word, “uncertainty,” is well-chosen. The impending sense of loss or harm, whether by bullets or bee stings, permeates the images of this collection, just as it does in our socio-political environment. EP: You mentioned earlier, regarding The Conversation, that there is tension in each work. And that got me thinking, it’s almost like you paint from a child's perspective, watching the tension happen and trying to decipher it; like the child sees the uncertainty, but also possesses the innocence to try and explain it. There's a darkness and a lightness. I wonder if you get these dichotomies from comic books? LP: I like the current work I make to be ambiguous without a strong narrative. I want there to be questions that invite the viewer to stay longer, speculate meanings and create their own answers. The dichotomies you address do not come from comic books, but often from films, especially films that were geared toward children, yet also had some frightening elements. I was a huge fan of Jim Henson as a kid and even wanted to work for him. Movies from the 1970s and ’80s like The Dark Crystal, Labyrinth, and Watership Down were beautiful, yet disturbing, and the emotional pull of them is remarkable. It’s the same kind of effect you find in copies of old children’s books. Folklore and fables were darker and unsanitized in their cautionary tales. I still pore through thrift stores in search of these musty old copies. EP: You talked about feeling more at ease now as a painter, and some of that must come from teaching, and some from having a bigger space to create for yourself. 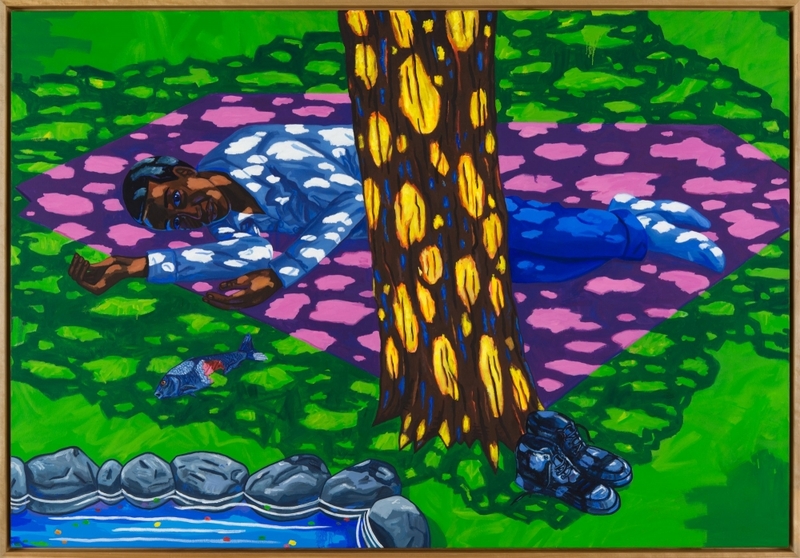 Has there been, at any point in your career, an added pressure from being a successful contemporary painter who is also African-American, in terms of young people looking up to you? Or is that something you don't think about? LP: I do consider myself as a possible influence for young painters of color. And I think that is a common ideal for all artists, to be a source of influence to the younger artist, but I do not feel any particular pressure to be some influential painter. I think my ease as a painter has to do with my ability to remain playful and to make work for myself without worrying about whether a collector is going to buy it. If I am true to myself and my work, eventually people will get it, and the market and collectors will follow. I guess, for me, the goal is to make the work I feel I need to make and let the chips fall where they may. And hopefully, younger artists, especially artists of color, will come to appreciate the path I took. EP: I always find this a hard question to ask, but what sort of painter do you see yourself as? I wouldn't necessarily say political painter, but I could be wrong. LP: I don’t think I’m a political painter, but we live in a time where most things are now politicized. People may read political statements into my work, but that is not my intent. That said, my own journey of making sense of our current political realities is bound to show up in some of my work. EP: What color moves you? Because you use color in a way that I feel is completely original. LP: I’m a fan of comics and children’s book illustrations from the 1960s and ’70s. I remember my early experiences with these books as being explosions of color. In Florida, where I grew up, everything is bright and colorful: the green grass, blue skies, full saturation. These early impressions directly influence my paintings. All color moves me, but I do feel I have a “signature” shade of blue, green and brown. EP: What were your favorite comic books as a kid? LP: Spawn was a favorite comic as a kid in the 1990s. I loved Todd McFarlane’s anti-superhero who happens to be black. The artwork, storyline, and the fact that the protagonist was African-American was a big influence on me. Although I do not buy comics anymore, as a kid, I collected the Spawn comics, as well as the corresponding action figures, which are like small works of art. EP: So you don’t follow comic book culture now? LP: No. I should get back into it. EP: I can't tell if the work is, at times, inherently humorous, or if the brightness and sunniness you put into the work is what makes me laugh a bit. Because I see something like, Satin Sheets, and I feel like it isn't actually funny anymore. Or even Young Man With A Fish, as well... but then I think of the Milk and Cookies series at Deitch around 2004, and I laugh again. Is a little chuckle okay? LP: I use humor or universal icons of giddiness (smiley faces, comical expressions, etc.) as superficial means of drawing the viewer in by the seeming playfulness of it all. After spending some time with the piece, it is not uncommon for someone to walk away feeling some dissonance with the more tragic elements of the pieces. We were trained as kids to laugh at the colorful cartoons of coyotes falling off cliffs. EP: What are your foundations in art? What moved you as a kid? What was life in Western Florida like? LP: I had limited exposure to contemporary art as a kid in Florida. I was a fan of Bob Ross’s Joy of Painting show on PBS. I used my dad’s old oils to paint along with Bob Ross on his show. I liked the fact that Ross was making these utopian worlds composed of carefully chosen, beautiful, though fictitious, landscapes. I was “the art kid” in school. School was difficult for me, but art was what helped me make my mark as a child. It was Eastern Florida where I grew up, first on military bases, then suburbia. The suburban Florida landscapes are a common backdrop to many of my paintings. EP: I hadn't thought about those suburban backdrops in your work, but that is a really interesting point. If you were born in a city, like NYC or LA, those lush backdrops and dichotomies would be so different. It's like the Florida backdrop allowed you to find a very unique way of layering meaning. LP: It wasn’t so much the Florida landscape as its colors. I compared the colors of real life in Florida to the simple scenes of idyllic landscapes presented in children’s books, often with the same saturated, bold palette. EP: As a professor in Drawing and Painting at the University of Minnesota, teaching ability becomes this important trait that you possess. Does teaching provide more opportunities to explore new styles in your own work? LP: Having a steady income from teaching has allowed me to play more and experiment with my work. The paintings have become much larger, which is a direct result of my having the physical space to make my work. Also, being around young artists and discussing contemporary issues and ideas related to painting has revived my work in ways that I am still processing. I feel more at ease at this stage of my life as an artist, and I hope that is reflected in my work.